We have to admit, we're not crazy about football. We just like to participate for a batch of Buffalo wings. The Super Bowl is a huge event (even if you're just watching for Beyonce and the commercials) and showing your team spirit is important. 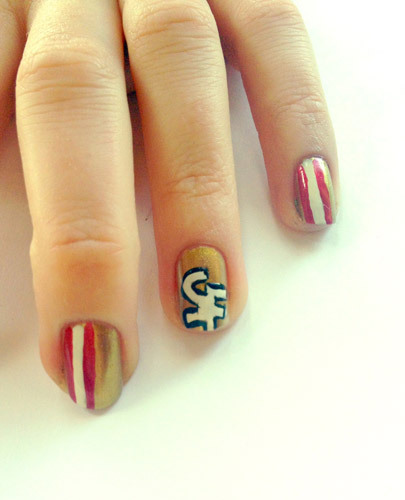 Unfortunately, we don't own any football jerseys (they just don't fit into our wardrobes) so the only way we will show our support is through nail art. We created two different designs to support the San Francisco 49ers and the Baltimore Ravens during the big game. 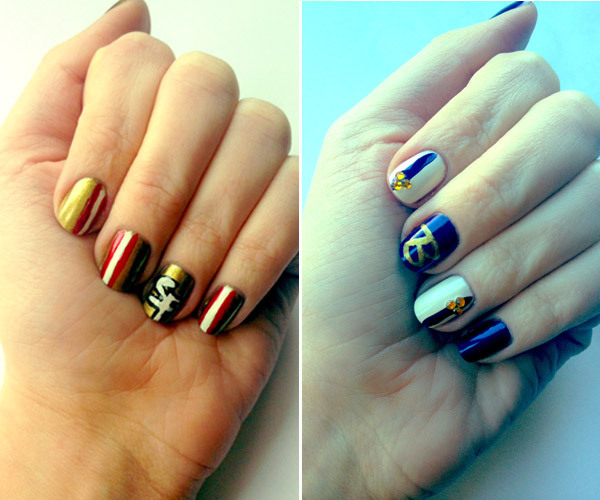 Which team will you rock on your nails? - A metallic gold nail polish. We used MAC polish in Immortal Gold. - A white nail polish. 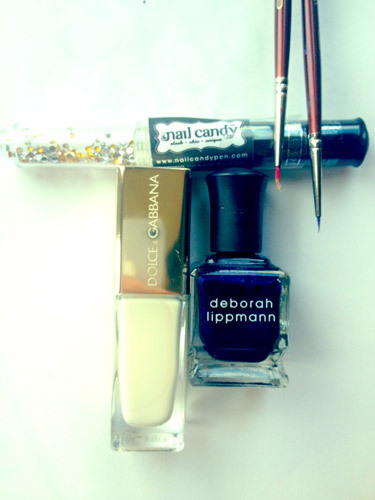 We used Dolce & Gabbana polish in True White. - A red nail polish. We used O.P.I polish in Thank So Muchness! - A black striper polish. 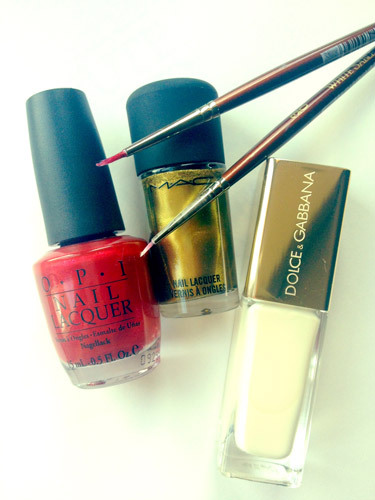 Start by painting your nails with the metallic gold nail polish. 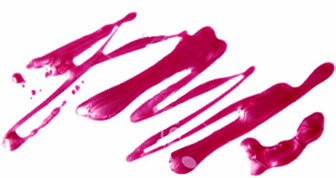 On your ring fingers, draw a letter S and a letter F (close together) using the thin brush and white polish. Then, outline the letters with a black striper polish. On the rest of your nails, draw a white line on either the left or the right of the nail and draw a red line on each side of the white line. This will look like the stripes on the players uniform pants. Finish it off with a top coat and you're ready for the game! - One or two thin, sturdy paintbrushes. - A dark purple nail polish. We used an irradescent purple by Deborah Lippmann called Dancing in the Sheets. - Six tiny gold crystals. We got our from a Nail Candy Duo. Start by painting your thumb, middle and pinky fingers with the dark purple polish, and the ring and pointer fingers with the white. 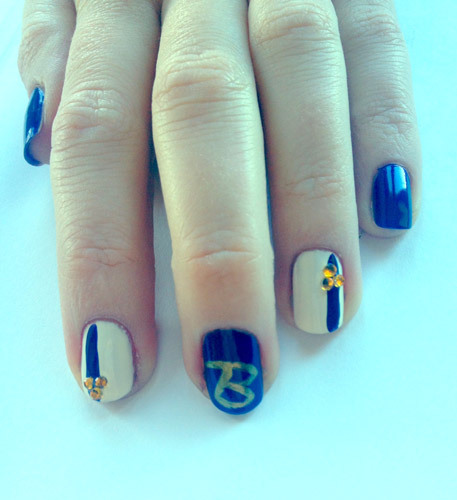 Draw a letter B (similair to the Baltimore Ravens "b" logo) using a paint brush and the gold polish on your middle finger. Then, on the two white nails, draw a vertical line using the purple polish and paint brush on the left or right of the nail. Embellish the lines with three gold stones on each nail. This will look like the player's unform pants (there's have a small B on the pant but we thought the stones were cuter). Finish it off with some top coat and you're ready to root for the Ravens! We hope everyone enjoys Super Bowl Sunday with their new manis!